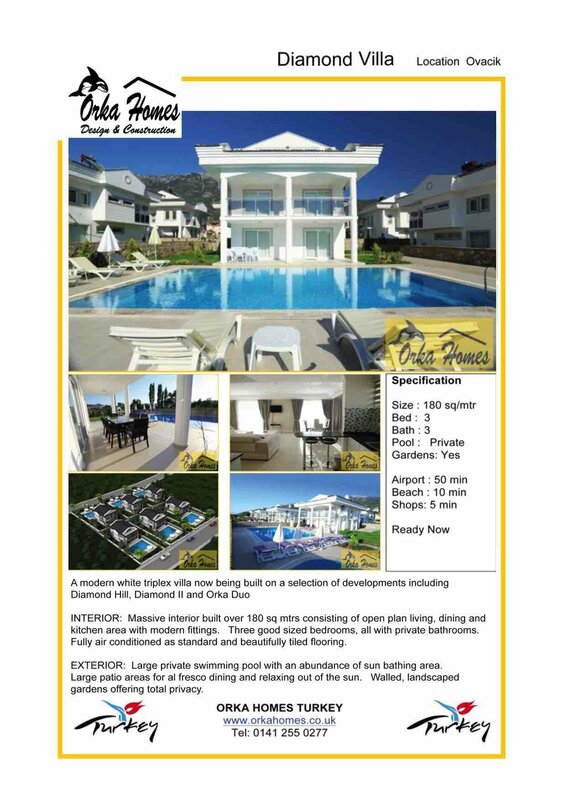 Our Diamond Villas for Sale in Ovacik are one of the best entry levels villas with your own private swimming pool and gardens. The villas are within walking distance to all the local shops, bars and restaurants making them an excellent choice for holiday rental income. The local beach of Oludeniz is just a short 10 min local bus ride away and our own Orka Hotel is within a few minutes walk. These modern white triplex villas are built in a couple of locations and are exceptionally large spacious holiday or residential properties with all bedrooms having en-suite facilities and with the front two overlooking the swimming pool and gardens. Lower Interior: Huge interior built over 180 sq mtrs consisting of open plan living, dining and kitchen area with modern fittings. Three good sized bedrooms, all with private bathrooms and come fully air conditioned as standard with beautifully tiled flooring.